Cases closed. Literally and figuratively. The five-decade-old mystery of how a pair of steamer trunks that once belonged to a talented stage actress ended up in the attic of a Charles City, Iowa, home has been solved. 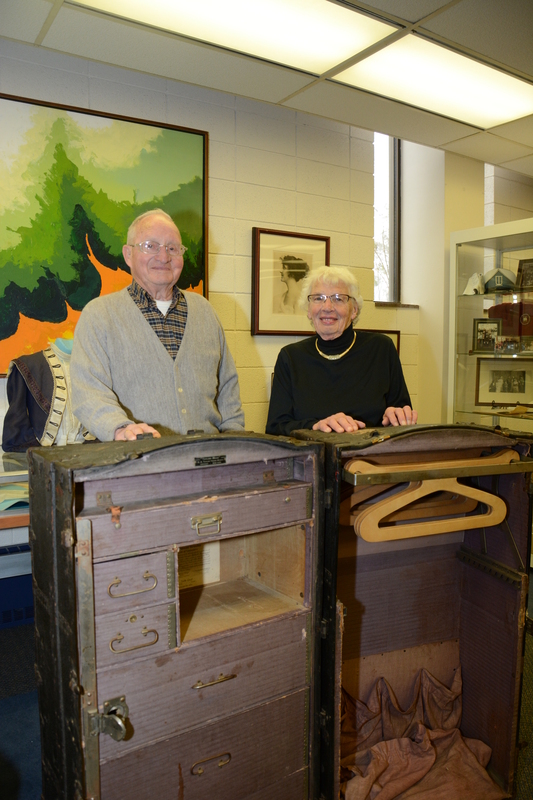 Loyal and Norma McLean are pictured with one of the two steamer trunks the Charles City, Iowa, couple donated to the University Archives at Upper Iowa University’s Fayette Campus. home they had just purchased. The luggage remained largely untouched in the family’s attic for the next 54 years when, upon closer examination last year, family members noticed a C.A. Taylor Trunk Works manufacturer’s guarantee on one of the trunks. Dated September 30, 1920, the document included the name Zinita Graf and an address in Fayette, Iowa. The McLeans’ granddaughter, Leah Reineke of Council Bluffs, researched the original owner of the travel cases and quickly discovered that Graf is a celebrated alumna of Upper Iowa University (UIU), but found nothing to link Graf to Charles City. Ultimately, the family decided that UIU would make a perfect home for the two forgotten steamer trunks and donated them in December. to Upper Iowa University caught the attention of Betty Salpekar of Woodstock, Georgia. Seeing the stories about the generous donation, she realized she finally had an answer to her own family’s long-standing mystery: What ever happened to the trunks? Soon after, Salpekar contacted UIU Archivist Janette Garcia and the two pieced together all of the details to finally solve both family’s age-old riddles. Graf studied oratory and liberal arts at Upper Iowa University, earning her bachelor’s degree in 1913. She made her professional stage debut in 1917 with the Deveraux Dramatic Company, one of the most talented acting companies of its time. Her casting as Beauty in the play “Everyman” sparked a very prosperous stage acting career. While Graf participated in transcontinental tours throughout the United States and Canada that would explain her need for the trunks, there was no evidence linking the former stage actress to Charles City. Graf passed away in 1930. It turns out that Salpekar’s mother, Delores Nicholson, herself a 1957 alumna of Upper Iowa University, purchased the trunks at a Graf Estate auction in Fayette in 1956 or 1957. Salpekar’s father was employed at the Oliver tractor factory in Charles City at the time and the family moved there in the summer of 1957. The trunks were placed in the attic of the family’s new home, where Delores mainly utilized them for storage. In early 1962, Salpekar’s parents sold the house to the McLeans and moved to Cedar Rapids. A few days after the move, Delores realized that the trunks hadn’t been delivered to the new house. She called the moving company, but they denied any knowledge of their location, insisting that they had emptied the attic. Salpekar’s mother settled on the notion that the movers had stolen the trunks, and a family mystery was born. Sharing similar sentiments as the McLeans, Salpekar said that her family is very happy that the Charles City couple donated the trunks to UIU, where they are in good hands and appear in the University Archives Zinita B. Graf exhibit at Fayette Campus. Located in Henderson-Wilder Library at Upper Iowa University’s Fayette Campus, the University Archives are free and open to the public. In addition to the Zinita B. Graf exhibit, there are numerous other special displays. Persons wishing to donate items to the University Archives may contact UIU Archivist Janette Garcia at (563) 425-5722 or garciaj26@uiu.edu.